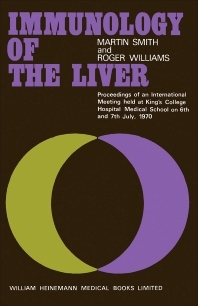 Immunology of the Liver contains the proceedings of an International Meeting held at King's College Hospital Medical School in London on July 6-7, 1970. The meeting provided a forum for discussing progress made in understanding the immunology of the liver and tackled topics ranging from the pathology of chronic hepatitis to the occurrence and distribution of tissue antibodies in liver diseases. Cell-mediated responses and manifestations of immunological damage are also explored. Comprised of 33 chapters, this book begins with an introduction to the clinical, morphological, and virological aspects of liver disease. In particular, the clinical spectrum of autoimmune liver disease is considered, along with the pathology of chronic hepatitis. Morphological and immunological studies on chronic aggressive hepatitis and primary biliary cirrhosis are presented. Subsequent chapters focus on antibodies related to mitochondria; leukocyte migration in active chronic hepatitis and primary biliary cirrhosis; immunologic observations and electron microscopy of halothane-induced hepatic injury; and humoral and delayed hypersensitivity in chronic hepatitis. The final sections deal with results of immunosuppressive therapy and the immunology of liver transplantation. This monograph will be of interest to immunologists, pathologists, physiologists, clinicians, and research workers in the field of medicine.